How to configure mailboxes to move spam messages to Spam folder server-wide in Plesk? It is not possible to configure mailboxes to move spam messages to Spam folder server-wide in Plesk via GUI. It can be configured individually for a mailbox. Vote for this feature on Plesk User-Voice portal. Top-ranked suggestions are likely to be included in the next versions of Plesk. As a workaround, it can be configured using CLI utility for Spamassassin. Click Add Event Handler . 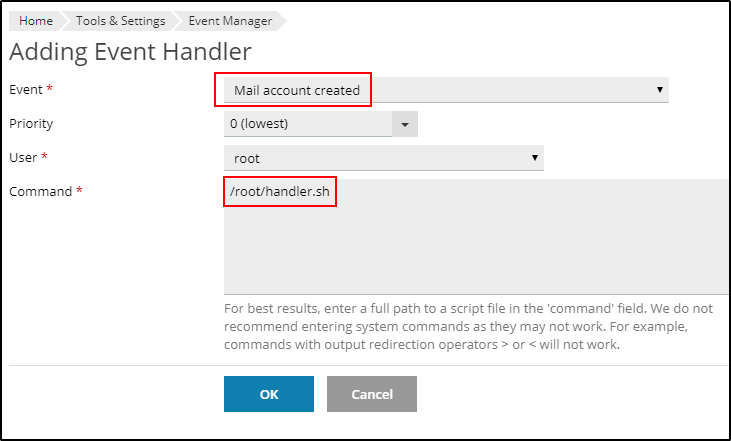 Select the event Mail account created and specify the path to the script in the Command field.